Protect your tools & equipment with Maintainer's Patented PSS! In general body cabinet construction, most manufacturers do not construct a water- or air-tight compartment. There are generally small voids where air can pass through near door edges or the weather-stripping. To avoid dust or moisture seeping through those voids, Maintainer installs a main fan and filter above the compartment being protected. As the engine is running, but while the main power to the body is off, the PSS will introduce air into the compartment, pressurizing the unit with up to 95 CFM of clean air. The clean air forces dust and moisture out of the compartment and off your tools so they will last longer and perform better. located outside of the compartment storage area. This maximizes the critical space available for tools and other components! 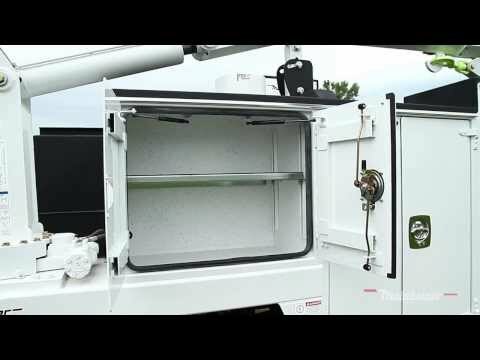 The patented system works so well due to the compartment material, construction, and the 3/16” aluminum doors (which are some of the strongest in the industry.) Maintainer uses metal-reinforced automotive weather stripping to help seal the cabinet along with gas-spring door holders and 3-point D-Ring compression latches. All of those elements combined create the best protection available for anything stored within the cabinet. Another advantage of Maintainer’s Pressurized Storage System is the fact that the system pretty much runs itself! As mentioned, the PSS is in operation as you drive to the job site. But once the operator starts working by turning on the main power to the body, the PSS will automatically disengage. That saves energy and will keep the system from running constantly. The system has proven to be effective in the dustiest and dirtiest work environments, as evidenced by the fact that nearly 90% of the service bodies we manufacture have the PSS option installed. Experience the Maintainer Advantage by choosing the patented Pressurized Storage System on your next custom vehicle.